The Branch was delighted to welcome over 70 members and guests to the Marlow Navigation building for this ½ day seminar on a very topical subject. Mentoring – a personal development relationship in which a more experienced or more knowledgeable person helps to guide a less experienced or knowledgeable person. True mentoring is more than just answering occasional questions or providing ‘ad hoc’ help. It is about an ongoing relationship of learning, dialogue and challenge. Leadership – the process of social influence in which one person can enlist the aid and support of others in the accomplishment of a common task. When our Branch Committee met earlier this year to discuss the topic for a ½ day seminar, we wanted to find something new to talk about, something that had not been discussed before. The seeds for the idea came after some of our Committee had been listening to young Deck and Engine cadets on their first trips to sea and their observations that the quantity and quality of mentoring guidance they received onboard ship varied dramatically – in some cases, it was very good and the senior officers took good care of them, spending time showing them and explaining to them all aspects of the vessel’s operation. But in other cases they had been left to their own devices, receiving no guidance or advice on their tasks. They were basically ‘extra hands’ for painting and mooring operations on a busy ship where nobody had the time or the interest to sit with them and explain something. At the same time, in the ship management offices ashore, debates continue on the need for constant and intense management of the shipboard operation as well as the readiness of young Officers for promotion. Do officers have the requisite ship handling or engineering skills and practical experience that are needed for Master or Chief Engineer position? To what extent can the ‘Office’ manage and control the shipboard activities? When we considered what it was that was occupying the minds and ‘day to day’ work of Ship Owners and Managers, it kept coming back to these issues of mentoring and leadership on board and whether it was sufficient to ensure that the vessel operated safely, economically and in a ‘ship shape’ way. Put simply, if the mentoring and leadership on board went smoothly, then the Managers ashore observed that the whole operation both afloat and ashore worked in a much better way with fewer incidents and accidents. 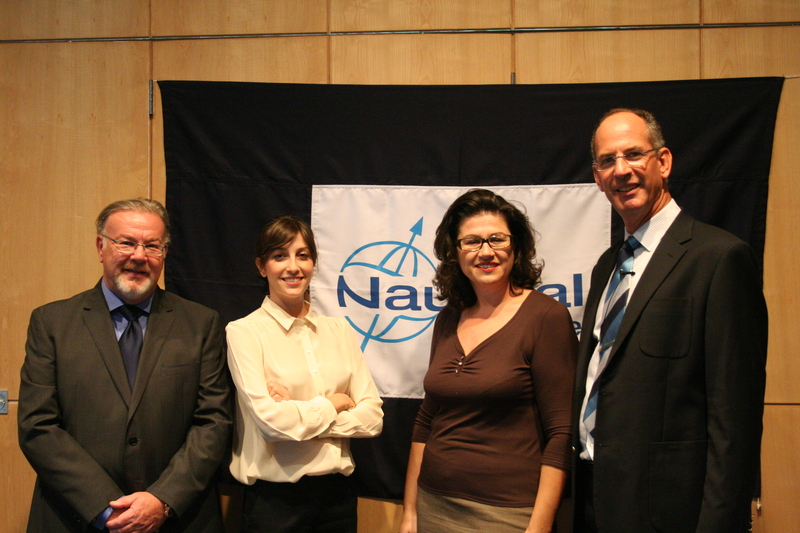 Four speakers from different parts of the industry – ship management , training services, HR management and training services provider – were asked to present papers. Graham Cowling, Branch Chair and Operations Manager for Marlow Navigation kicked off with a key note address on the current ‘drivers’ in the industry – technological advancement, ship operating economies, ship life span, communications and the younger generation of seafarers as well as the increasing regulatory environment. He also explained that the industry has deteriorating insurance loss ratios and increasing navigational accident frequency. These factors were then used to demonstrate why leadership/mentoring was so essential. Industry solutions so far had focused on piling more and more supervision requirements on the Superintendent and intense remote monitoring into almost all aspects of the ship operation. But these did not seem to be working and the question was raised – to what extent can vessels be remotely managed in place of good leadership and management on board? Our second speaker was Doctor Marina Papaioannou , Manager, GL Academy Hellas, who spoke first of all about the ways in which we learn. In the marine industry there is still more emphasis on technical skills and knowledge rather than the ‘soft’ non-technical skills. Marina then went on to develop the qualities of a good leader compared with a manager. For example the leader uses personal power and vision, he persuades and gains trust and confidence while the Manager controls, appoints, gives orders and emphasizes procedures. Nicely summarized, Doctor Marina stated that ‘Leaders do the right things while Managers do things right!’ So are Leaders born or are they made? It seems to be a combination of both. But Masters and Chief Engineers on ships certainly may not be born leaders but they need to learn to lead! 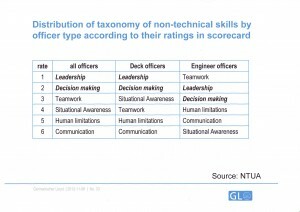 An analysis of merchant marine officers responses asking them to rate various non-technical skills showed an interesting difference between deck and engineer officers. 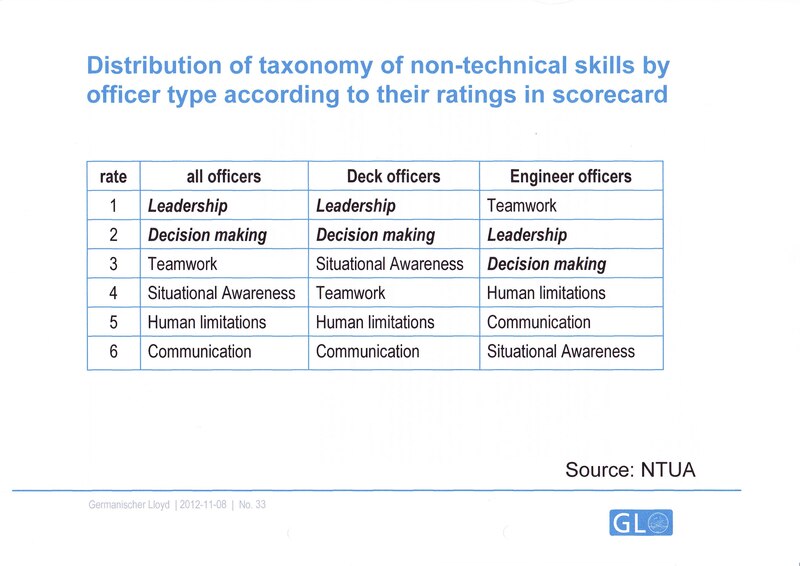 For example, engineer officers rated teamwork above leadership and decision making while deck officers rated leadership as the highest priority. It was interesting to note that neither group rated communication as highly importance! Marina then went on to look at mentoring – the stages of mentoring from initiation and cultivation to separation and redefinition. The positive benefits of mentoring for both the mentor (career advancement, passing the torch and learning from the mentee) and the mentee (career advancement, salary improvements, organization and professional identification) were discussed. Finally Marina developed the idea that ‘mentoring’ and ‘leadership’ were essential cousins – because mentoring can reduce the probability of leadership failures. Our third speaker was Stella Kazamias, Human Resources Manager of Interorient Marine Services Ltd. Stella’s task was to develop how we can achieve leadership and mentoring training within our companies. Her ideas included development of annual officers leadership and skill development workshops where both sea and shore staff attend and work on various projects together to find solutions. Stella was keen that companies design a leadership framework which clearly defines leader’s behaviours and expectations thus ensuring that everyone in the company understands what is needed for good leaders and mentors to develop. Frequent ‘one-to-one’ coaching/mentoring meetings were needed both ashore and on board ship to provide continuous feedback. The office also needs to be very much involved with the process giving it support and encouragement. Cultural awareness training, project-leadership opportunities, performance assessment and promoting a climate of ‘trust’ were other important ideas. Our final speaker was Mike McCabe from Seagull. Mike’s presentation was entitled ‘Knowledge and Experience – do they have what it takes? ?’ Mike presented us with a scenario where there was a serious problem on board and the Managers were faced with a series of dilemmas – do they actually know the competence of the decision makers on board and was all the information available from the ship to make the correct decision? This very much depends on how accurate are the appraisals, Superintendent assessments and evaluations of the seastaff. Mike reflected on how this process used to be done – onboard training and mentoring from seniors to juniors with almost hourly instruction, advice and guidance on ‘how to do the job’. Nowadays this element is missing and new systems of onboard learning have to be offered. Finally Mike explained some of the other training programmes and tools that could be offered by his group to assist with mentoring and leadership on board. After our speakers , there was a very active Q&A session discussing the many issues of ship-shore communication, methods to motivate, management of ships from ashore. Then all participants were asked to complete a questionnaire. The key points and findings of the questionnaire are published below and give valuable insight into the development of mentoring and leadership training. 97% of participants considered that there were leadership and mentoring issues for the industry to deal with after attending the seminar. 58% of participants did carry out some form of mentoring and leadership training. The positive response from this feedback showed that this is a very important subject.